Freshman Democratic congresswomen Ilhan Omar (Minn.) and Rashida Tlaib (Mich.) defended their comments on Israel and its influence in the United States on Wednesday night at Busboys and Poets, a restaurant owned by a man who himself has said the United States takes "marching orders from Tel Aviv." The Washington, D.C., restaurant was filled to capacity for the "Progressive Town Hall," which also included representatives Pramila Jayapal (D., Wash.) and Mark Pocan (D., Wis.), who heads the influential Progressive Caucus in the House. The members were introduced by restaurant owner Andy Shallal, an activist who in addition to arguing that the United States takes orders from Israel has accused the Jewish state of "terrorizing" the Middle East. Omar, a Somalian-born Muslim from Minnesota, has found herself apologizing for comments she made about Israel that have been deemed anti-Semitic, but on Wednesday night defended her criticism of Israel and said the criticism comes just because of her religion. 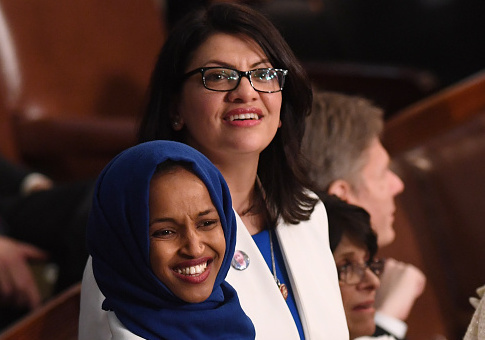 "What I am fearful of, because both Rashida and I are Muslim, is that a lot of our Jewish colleagues and constituents go to thinking that everything we say about Israel is anti-Semitic because we are Muslim," Omar said. "It's something designed to end the debate." "It's almost as if every time we say something that is supposed to be about foreign policy, or advocacy about ending oppression, or the freeing of every human life, we get to be labeled and that ends the discussion," she said. "We end up defending that and nobody gets to have the broader debate about what is happening with Palestine." "I want to talk about the political influence in this country that says it is okay for people to push for allegiance to a foreign country," Omar said. "I want to ask why it is okay for me to talk about the influence of the NRA, or fossil fuel industries, or big pharma, but not talk about the influence of a powerful lobbying group that is influencing policy." The remark appeared to be directed at one of her Jewish colleagues, Rep. Lee Zeldin (R., N.Y.), who has dismissed Omar's public apologies for anti-Semitism as insincere. The two new congresswomen have been a thorn in the side to establishment Democrats, who have been pushed to join in condemning both Tlaib and Omar this year. Neither showed any indication on Wednesday night that they intend to be more measured in the future. Tlaib, in her opening remarks, suggested that the Progressive Caucus change its name to the "Warrior Caucus." There were big cheers in the crowd at criticism of the United States military, especially when one attendee suggested that the military budget be slashed to help pay for liberal programs such as the Green New Deal and Medicare for All. "Fifty-three cents of every discretionary federal dollar goes to the military, and we're going for wars that fail to do everything except kill people, and mostly they kill people of color," the attendee said. The Democratic members smiled and nodded in agreement as the attendee added that military spending doesn't help keep us safe, but just "kills people and makes other people hate us." Asked whether military spending should be cut to "pay for the Green New Deal, Medicare for All, universal health care, and free college education," Omar laughed and said, "the answer was in your question." The Green New Deal is estimated to cost $94 trillion, about one hundred times more than this year's military budget. The event at Busboys and Poets was another sign of a quickly shifting view of Israel on the political left. Just two years ago, the Democratic National Committee relocated a scheduled event from the venue after criticism of Shallal's views on Israel. Shallal has also also hosted a fundraiser at the restaurant in honor of the man who was killed attempting to stab an Israeli soldier during the 2010 Turkish flotilla to Gaza and produced a play called The Admission, which centers around the fictional slaughter of Palestinian civilians by an Israeli soldier. The restaurant has become a go-to venue in D.C. for far-left groups—it has hosted 9/11 "truther" organizations, domestic terrorist Bill Ayers, and a series of pro-Hugo Chavez events sponsored by the Venezuelan government. The situation in Venezuela was touched on by Omar, who compared Venezuelan strongman Nicolas Maduro to President Donald Trump, and said the United States decision to back Juan Guaidò would be like if a foreign power attempted to install Hillary Clinton as president. "None of us are happy with the kind of president we have," Omar said. "Now if a foreign country just said, ‘Well, we think because Hillary got lots of votes, we're just going to acknowledge Hillary as the leader of the United States.' We would have a problem with that." This entry was posted in Politics and tagged Ilhan Omar, Israel, Progressive Movement, Rashida Tlaib. Bookmark the permalink.